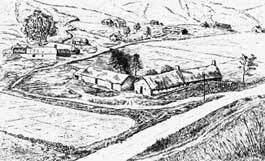 This drawing shows the joint-tenancy farm at Auchindrain. Fermtouns (Gaelic 'clachan') were once common in most parts of Scotland. The buildings occupied by any one household might comprise a house with adjoining byre (for housing cattle) and a barn, where cereal crops were threshed. In the late 19th century, there were still more than 100 people living here, most of them joint tenants and their families. There were also also 'cottars', who had only a house and garden. The last tenant moved out in 1963 and a Trust formed in the following year. The site is now preserved and open to the public.